Where once we just recommended a standard pregnancy multivitamin and thought no further about nutrition, researchers are now finding that nutrition requirements fluctuate both from woman to woman and even throughout pregnancy. Take folate as an example, the benefits of folate supplementation to prevent neural tube effects is well accepted however a recent systematic review has found a correlation between supplemental folate intakes into late stage pregnancy and the development of childhood asthma and allergies. What’s the key message? A multivitamin is not necessarily the whole solution to good nutrition. Supplementation needs to be based upon an individual’s dietary intake and stage of pregnancy. Docosahexanoic acid (DHA) omega 3 is a major structural fatty acid in the brain and eyes. Although adequate omega 3 consumption is obviously required throughout pregnancy for brain and visual development, a large randomised controlled trial by renowned Australian clinical researcher, Professor Maria Makrides found that DHA supplementation did not produce the objective primary outcomes expected. Conversely maternal ingestion of at least 340g (2-3 serves) of oily fish per week has been associated with better child IQ scores, fine motor co-ordination skills and communication skills associated with adequate omega 3. What’s the key message? Encourage your clients to consume low mercury, omega 3 rich fish such as salmon two to three times per week during pregnancy. We’ve all noticed the exponential increase in food allergies, particularly amongst children throughout the past few decades. Prospective studies indicate that this proliferation is at least in part the result of a decrease in bacterial diversity in our gut, particularly during pregnancy. Consequently, optimising gut flora should be a priority for health professionals educating mothers-to-be. Although research remains limited as to the strains and volumes required, probiotics may be beneficial. A recent meta-analysis by Pelucchi and colleagues found that probiotic supplementation in pregnancy, infancy (through breast feeding or directly to the infant) or both, reduced the risk of atopic dermatitis in infants by 21%. More importantly foods that have a prebiotic effect such as legumes, garlic, oats and bananas help to proliferate the microbiome organically. What’s the key message? Probiotic supplementation in pregnancy and breast feeding may have a role in allergy prevention. 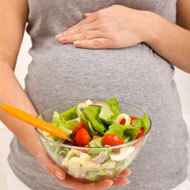 Encourage the intake of foods which have a prebiotic influence, especially during pregnancy and pre-conception. Melanie McGrice is one of Australia’s best known dietitians. She is a highly respected author and health presenter on nutrition and dietary issues – and a lover of great food! Join her free nutrition and wellbeing network at www.melaniemcgrice.com.au. Tagged dohad, melanie mcgrice, perinatal diet, pregnancy.